A Slice of Life: I will miss you BETH! I will miss you BETH! 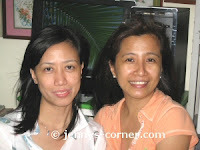 One of the best friends (Beth) visited me a couple of days ago here at my Internet Cafe. We have been friends way back in our college days during our "on duty" training at the St. Martin Hospital in San Juan as Medical Technologists Interns. We also have the same hometown and i am the godmother of one of her sons. It is always fun to see and hear from her. I always call her "Betchay" and there are times when we go at the hospital together and have the same night duties. She's a great friend and very resourceful one. After college she landed a job right a way as a Med Tech. at a gov't. hospital in Marikina and she was there since the late 80's lol. She just recently resigned at her job at the hospital bec. her whole family will be migrating in CANADA this coming August. When i learned that she will be migrating i can help but to be sad and happy for her. I will dearly miss her but i know e-mail is just a click a way to keep in touch..
Man... I know exactly how you feel! Well, good luck, Beth!